Full Circle: Art as Reflection was designed by Holly Ewald and fabricated by the Steel Yard under the direction of Tim Ferland. The 16’ x 8’ metal sculpture floats out in Mashapaug Pond featuring silhouettes of the natural life of the pond and the Indigenous People who have maintained connections with this site for centuries. Artist Holly Ewald conceived Full Circle: Art as Reflection to draw attention to the pond and provide a vehicle for community engagement. During the summer the sculpture doubled as a film screen featuring: Indigenous films curated by Loren Spears, Director of the Tomaquag Museum;The Lorax accompanied by water testing demonstration and discussion about the health of Mashapaug Pond; and Silvered: Tracing Gorham at Mashapaug Pond a multimedia performance by Erik Carlson and Erik Gould. Full Circle is a joint project of UPP Arts and the City of Providence Department of Art, Culture + Tourism. Its activities, including school workshops, an annual procession and the film series, were made possible with a grant from the National Endowment for the Arts and the City of Providence Department of Art, Culture + Tourism. 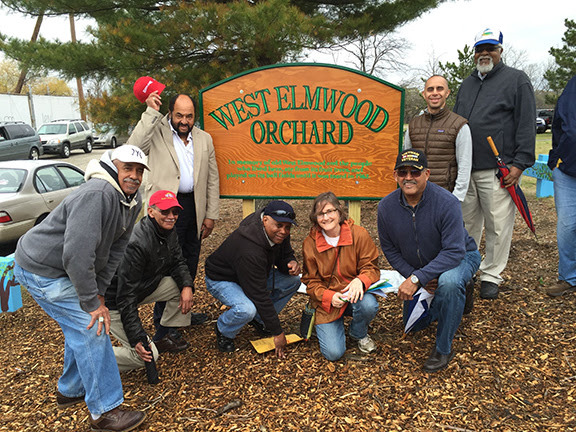 Sometimes our projects become permanent installations like the commemorative West Elmwood Orchard planted by volunteers in J.T. Owens Park for the West Elmwood neighborhood, which was razed in 1962 to make way for the Huntington Industrial Park and J.T. Owens Park. The Orchard was formally dedicated in April 2016.